Tag Archive | "Park Center Lanes"
Back row L to R: Assistant coach Trevor Ruark, Sarah Galloway, Katelyn Paige, Alexa Thompson, Rose Baty, Coach Tim Jackson. Front row L to R: Michayla Paige, Omani Morales, Gabi Lamek. On December 16, Cedar Springs hosted a tournament at Westgate. The girls lost in the first bracket of the tournament round to Wayland. Junior Rose Baty bowled her high school high of 178. On December 20, Cedar Springs had a conference match against Ottawa Hills. Both the boys and girls won 30-0. On December 26, Cedar Springs attended a baker tournament at Park Center lanes. The boys finished 6th out of 11. The girls took home a 2nd place trophy losing to Caledonia by 1 pin—317 to 318. Red Hawk boys bowling team took 2nd place in a baker tournament at Park Center Lanes. Left to right Jared Caniff, Brayden Harper, Dane Conely, Jonah Drake, Dugan Conely, Jared Liggett, Josh Hamilton, Kaleb Fisk, Coach Tim Jackson. On December 27, Park Center lanes in Wyoming hosted a baker tournament. 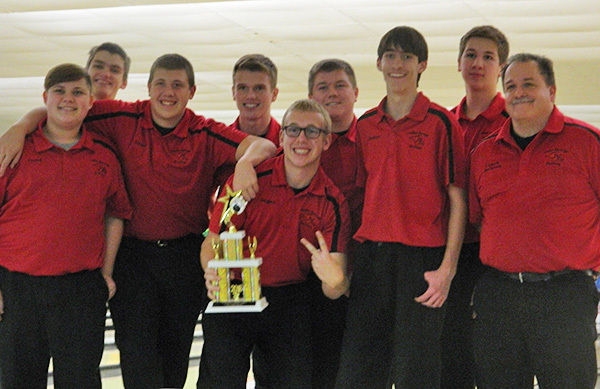 The Cedar Springs Boys bowling team took 2nd Place against South Christian with a 2 baker total of 302-348. The Lady Red Hawks bowling team fell short to Hopkins in the semifinals. Sophomore Sarah Galloway bowled her High school high of 211 and sophomore Rose Baty bowled her high school high of 117. On January 4, the Red Hawks hosted a conference match at Rockford Lanes against Northview. The Cedar Springs boys team fell short with a score of 4-26, and the girls lost 2-28. On January 8, the teams competed at the Jenison invitational. The CS boys team placed 5th. Red Hawk Josh Hamilton placed 5th in the individuals for boys with a pin total of 413 in 2 games. Pictured left to right: Coach Jackson, Ellie Ovokaitys, Kathy Dancer, Melissa Meguire, Rebecca Williams, Allyson Marvel, Emma Schut, Sarah Galloway, and Breanna Feikema. 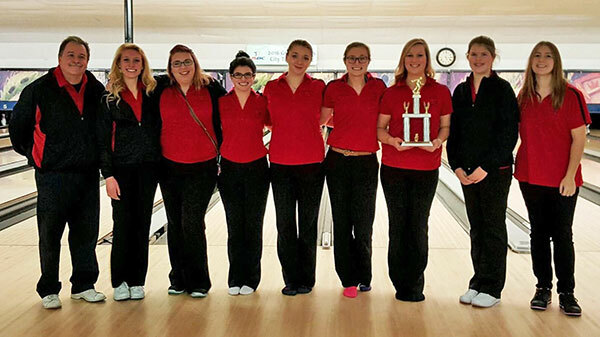 On December 29, at Park Center Lanes, the girls team took second place at a baker tournament. The girls had a match Monday January 11 at Spectrum Lanes against Wyoming and won. During the match, Allyson Marvel bowled a 265 game. 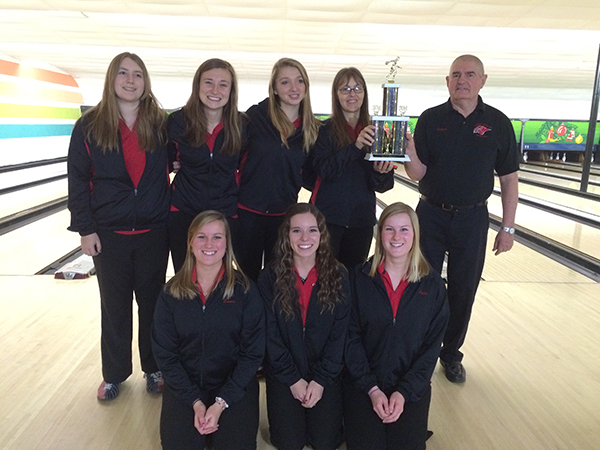 The Cedar Springs Girls Bowling team took first place at the Catholic Central Invitational. Pictured is: Back row: (L to R) Bre Feikema, Allyson Marvel, Rebecca Williams, coach Heidi Feikema, and coach Roger Filut. Front row: (L to R) Emma Schut, Tamara Tiethoff, Julie Schut. 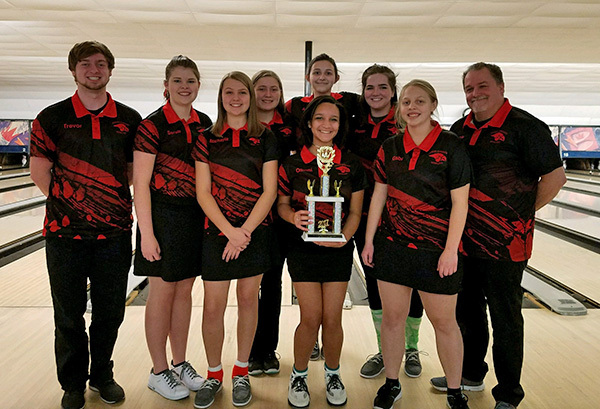 The Cedar Springs Girls Bowling team took first place at the Catholic Central invitational, on December 30, at Park Center Lanes. Ruark said there were 13 teams at the tournament, and after 15 baker games, they took the top four teams, with Cedar Springs girls being 4th. They went up against Northview and bowled two more baker games and won, with scores for Cedar of 146 and 164 against Northview’s scores of 133 and 133. They moved on to play against Wyoming. They bowled two more baker games against them and won first place, with scores of 127 and 175, over Wyoming’s 148 and 119. The Cedar Springs girls also took first place at the Allendale invitational on December 13.